Apply Stigma to self, enemies at target. "The acting guild master of the Aoyama Missionaries, the biggest guild in the 23 wards. She is also the vice president of the Daikanyama Academy Student Council in Shibuya Ward. She leads the ever expanding Aoyama Guild, which spreads from Minato Ward to Shibuya Ward and is comprised of Transients who have fled from other areas. 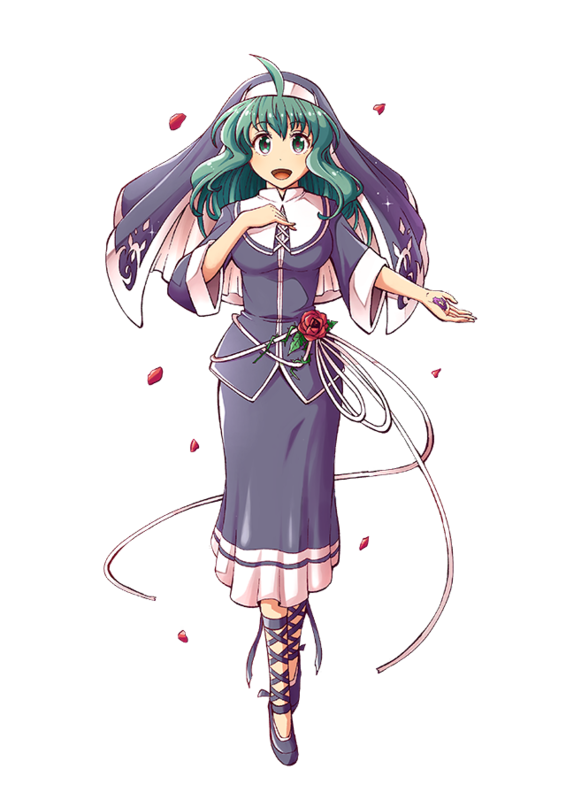 She is a plucky nun whose strong will enables her guild to resist all the harassment aimed at them from the neighboring Roppongi Guild. She's been involved with the guild since they were still a volunteer group that provided welfare for stray Transients. As she never acts out of self-interest, she does not get along with entrepreneurial types concerned with wealth." A high school girl who serves as the acting guildmaster of what may be the most influential guild in the 23 wards of Tokyo the Aoyama Missionaries in the absence of the true guildmaster. She also serves as the student council vice president in the Shibuya Ward's Daikanyama Academy. With the number of stray summons escaping from other wards, the Aoyama guild spanning from Minato to Shibuya, and dealing with the adjoining Roppongi guild's continuing harrassment, she is a gutsy nun. Ever since the guild's origins as a volunteer organization, she has been helping with the welfare programs made for stray summons with nowhere to go. As she has never seeks self-profit, she is bad at handling relations with the wealthy and merchant types. "She holds the Sanctified Nails Sacred Artifact that can transfer the pain and injuries of others to herself. She is best friends with Gabriel, the mascot and idol of the Aoyama Guild. In the past, she hated the entire world, but after experiencing a one-time-only miracle, she changed her way of life. She has lead a treacherous life beyond anyone's imagination. The name ""Maria"" is also not her real name. She considers those who bear the burden of their sins her comrades in arms. " She possesses a holy nail Sacred Artifact able to transfer other people's wounds and suffering to her own body. The mascot of the Aoyama guild and idol angel Gabriel is her best friend. She once hated everything in the world, but because of "just a single miracle" she changed her way of life. That girl who carries a past so gruesome anyone would avert their eyes is not truly named Maria. With people who bear the awareness of sin and are tied to it, she holds a close, deep empathy that could be compared to comrades in arms. I've been entrusted with the Aoyama guild. I may be inexperienced, but please call me Maria. I've decided on the path I should walk. Please step aside. A miracle happens but once in my life. Heaven, please rain their suffering upon myself... Golgotha Crucifix. This world is Hell. But that is why I cannot stop walking. You who carries my pain on your back... Is it okay... is it okay if I cry, just a little bit? "The International School, Daikanyama Academy, in Minato Ward, teaches international culture to the students quarantined within Tokyo. The student council vice president there is also the acting master of the Aoyama Guild. She is a powerful and fierce high school girl who goes toe to toe with her classmates and teachers. This year, over Summer School, they will have an exchange with students from other schools. Despite a plethora of troubles that occur, she tries her best to make the event a success. She originally wore the school-designated swimsuit, but ended up changing into one Gabriel recommended for her." Within the blockaded Tokyo in Minato Ward is the international school Daikanyama Academy that teaches its students cultures and festivities from other countries. The student council vice president there also acts as the guildmaster for the Aoyama guild. She is a stern, powerful high school girl who will never lose to her classmates and individualistic teachers. The seaside school this time has become a cultural exchange between members of her school and members of other schools, so in the midst of various troubles occurring her characteristic power runs about to the east and west of this beach in making this event a success. This is her school's swimsuit uniform, but has she changed into the swimsuit her best friend Gabriel recommended to her on the way? My name is Maria, and I am Daikanyama Academy's student council vice president. Umm...this outfit is embarrassing, but I hope we get along. 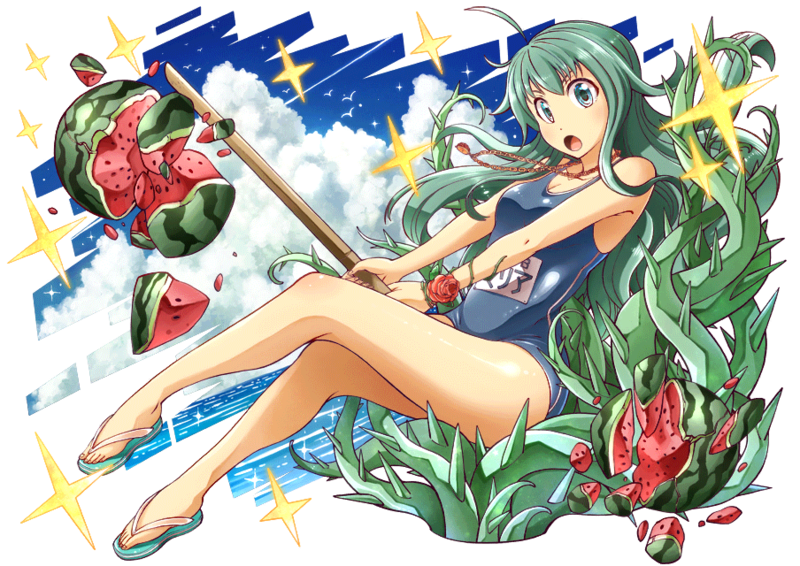 As Daikanyama Academy's Vice President, I will also do my best...at watermelon smashing! This truly is what summer is about! Ruthlessness to Watermelons, here! Yaah! The battle is over. Now let's begin the postmortem. Her Charge Skill, Golgotha Crucifix, is in reference to Golgotha, the hill where Jesus was crucified. Maria's sacred artifact, the Sanctified Nails, and the location of her marks on the palms of her hands, is a reference to Jesus's crucifixion. The artifact's manifestation as thorny vines are also a reference to the crown of thorns Jesus had to wear in his punishment. Maria gathering the pain of others and transferring it to herself is also a reference to the absolution of everyone's sin through Jesus's sacrifice. Maria herself may be a reference to an unnamed sinful woman who anoints Jesus's feet, and who is often confused/conflated with Mary Magdalen, which has caused a widespread inaccurate belief that Mary was a repentant promiscuous woman. 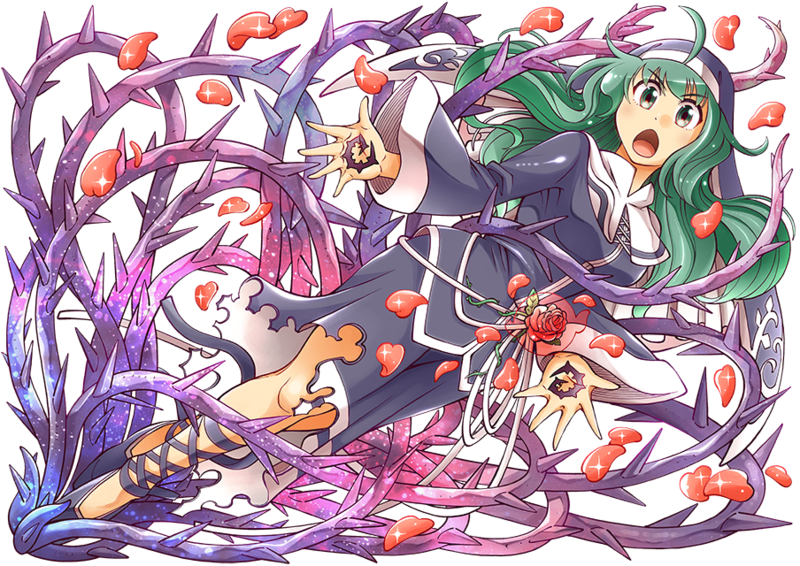 For some reason, she reminds me of Sanae. It's probably the green hair. She's so cute I loved her voice and design. Salty much? If you don't like Maria, chill out and let those of us who do have our fun. Currently doing Ch 4. I ship them hard! This page was last edited on 19 December 2018, at 17:44.